One of my library lists alerted me to this marvelous short film, The Fantastic Flying Books of Mr. Morris Lessmore, by William Joyce and Brandon Oldenburg of Moonbot Studios. Said to be “inspired by ﻿Hurricane Katrina, Buster Keaton, The Wizard of Oz, and a love for books,” the film is a valentine to books and the healing power of stories. For this week’s story time, we visited Africa! Our puppet play was based on Eric A. Kimmel’s retelling of Anansi and the Moss-Covered Rock. Anansi, the Spider trickster, discovers a mysterious moss-covered rock in the forest. Stranger still, the words “strange moss-covered rock” seem to trigger instant unconsciousness in anyone who utters them in the rock’s presence. One by one, Anansi lures each of his friends into the forest and shows the rock. Then he runs back and steals their food while they are unconscious. But Rabbit has seen what he is doing, and, when it is her turn to be led to the strange rock, she pretends not to see it. Anansi gets so worked up over her obtuseness that he slips up and says the magic words himself. Then Rabbit goes to Anansi’s house and takes all the stolen food back to its rightful owners. But does Anansi learn his lesson? Once a trickster, always a trickster! Check out the cool Anansi finger puppets the kids made. I loved how some of them recreated my Anansi puppet’s kufi in miniature! For this week’s story time, I told one of my favorite stories, The Tale of Two Bad Mice, by Beatrix Potter. My rather flimsy flannelboard backdrop that I made last year did not survive the move, so Stuart made me a much sturdier (and larger!) one out of cardboard. We are working on a much grander plan, but this beta version looked great and performed very well. The bad mice are so delightfully naughty, with feathers flying as they trash the bedroom, that kids always get a big kick out of my retelling with puppets. For more pictures, see this post from one of last year’s performances. Afterwards, the kids made paper bag puppets of Hunca Munca and Tom Thumb. The Tom Thumb puppet had a blue collar, and the Hunca Munca had a lace apron and/or cap. We had our after hours pajama story time and stuffed animal sleepover last Friday. We had 33 kids, 36 stuffed animals, and 35 adults. The animals got to spend the night in the library! I tried out the Alphabet dance/stretch that I learned from my calligrapher friend, Ewan Clayton. You draw invisible letters of the alphabet, with flourishes, using your full reach like Leonardo da Vinci’s Vitruvian Man. The kids had a blast with this. What fun to have a full body physical memory of each letterform. I am going to make this a regular feature of my story times. Then we presented Interrupting Chicken, by David Ezra Stein, as a puppet play. The chicken puppets used the top of the puppet theater as their stage, disappearing behind it when each bedtime story began. As Papa Chicken began to read, Jill, our branch manager, lifted the book into the puppet theater stage, open to each bedtime story spread. Chicken jumps in front of the book to interrupt the story, and Papa Chicken reappears above the theater, calling, “Chicken.” “Yes, papa?” Chicken answers, appearing next to him. Kids and parents loved it. Before our second story, The Owl and the Pussycat, by Edward Lear, we all sang “Row, Row, Row Your Boat” to get in the mood. We split into groups and sang it as a round, which worked really well. Choral singing starts young in this community! The action took place on the puppet theater stage. The pea-green boat, the small guitar, the Piggywig, the runcible spoon….we had it all. The Owl and the Pussycat kept stopping to smooch as they danced by the light of the moon, which the kids enjoyed hugely. After the stories, the kids made paper bag puppets. They could make a Chicken, an Owl, or a Pussycat. Note to self: mammals win every time. Chickens were least favored, followed by Owls, with Pussycats the clear winner. Fortunately, I was prepared for this contingency and was able to quickly make up some extra Pussycat sets. I designed the three animals to use almost identical, largely interchangeable parts. Thanks to the great work of Jill and our super volunteer, Janet—and always Stuart!—handing out all the project supplies went amazingly smoothly. Here are some of the fabulous puppets made that night! After singing “Twinkle, Twinkle, Little Star,” led by Maestro Copernicus Mouse, the kids said goodnight to their toys and headed home. There were a few tears, and daddies substituted some less well-loved toys that could be parted with for one night. 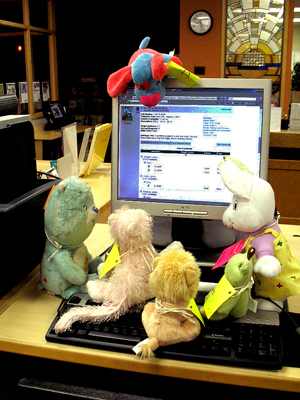 Then it was time for the stuffed animals to explore the library! My friend Linda, musical partner and former boss, just sent me a link to this Harvard Business Review blog piece by Grant McCracken, who was charmed by a similar event at his local library. He speaks of libraries as portals to magical realms, reaffirmed by programs such as this. The library as place, a home away from home filled with possibility and serendipity, coexists easily with the virtual library we can access electronically any time, any place. How could I forget to include our story time celebration of the Year of the Dragon? Especially since I am a Dragon and have been looking forward to this year for a long time! I read This Next New Year, by Janet S. Wong, and told the story “Big Fish” (from Usborne Stories of Dragons, by Gillian Doherty) about a fisherman who catches a huge fish that turns out to be the son of the Dragon King under the sea. In return for freeing the dragon, the fisherman finds that he has abundant catches forever after. The next I went to the iYouth conference at the University of Washington Information School the next day, and got to meet Janet Wong in person! And she autographed my copy of This Next New Year! Her presentation was great, as was the entire conference. I have so many new ideas to try out. Here are the simple Dragon puppets we made at our story time. Every winter I look forward to telling the Navajo story of Ma’ii (Coyote) and Horned Toad. There is a set of stories that are told only during the winter, so one’s appetite is whetted for a whole year! I tell a version of the story that my friend, Erik Bitsui, told me. I always try to channel his portrayal of the gruff, taciturn Horned Toad. There is a wonderful picture book version by the renowned Diné artist, Shonto Begay: Ma’ii and Cousin Horned Toad: A Traditional Navajo Story. I had planned to tell this story the previous week, but we got off schedule in January when our library was closed due to snow. So my lunar new year story time was delayed a week. After the snow melted, we had much warmer weather, so I’m glad I didn’t wait any longer! I love bringing the story to life with my lovely horned toad puppet, inherited from my parents’ folk art collection. After the story, the kids told me they were worried about how the story would turn out. But it had a very satisfactory ending.